EPDM bellows, no tie bars, simple element renewal. The SUPAFLEX Division of Interflex Hose and Bellows is always keen to promote new ideas on bellows technology to Building Services Engineers. Rubber bellows with tie bars are bulky and not particularly good for dampening noise and vibration even with large rubber isolators under the tie bars. Untied bellows are much better. However, tie bars do restrict the growth in length under increasing pressure in the larger sizes. All too often tie bars are specified on small sizes where the elongation in length does not happen because the spring rate of the element resists the relatively low pressure in a Building Services Installation. It’s quite common to go into plant rooms and find loose tie bars on bellows fitted to small pumps and equipment. So, the industry has done something about it, with a material developed by Dupont; used in space exploration in space suits and by many of the world’s police and armed forces for body armour. We’re talking about KEVLAR. 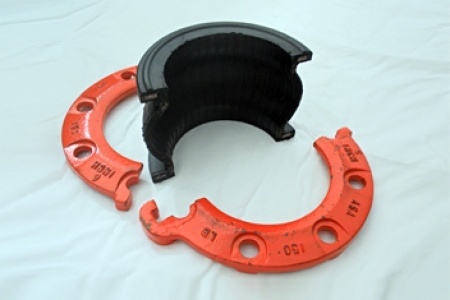 This is a far superior material to nylon reinforced bodies in rubber bellows and also steel cord reinforcing. Nylon becomes brittle with age and steel cord, whilst better, eventually corrodes and fails. KEVLAR reinforced bellows used in building services rarely need tie bars. The vast majority of LPHW, MPHW and CHW systems don’t often exceed 8 bar working pressure, with most working on half this, or even less. Elongation is minimal, so too is temperature resistance and ageing resistance is also high. They can be used at constant temperature flows to 121 degrees centigrade and research has shown that EPDM KEVLAR REINFORCED BELLOWS will stand intermittent temperatures up to 176 degrees centigrade. SAFEFLEX EPDM KEVLAR REINFORCED BELLOWS have a hard steel rim moulded in, which does not pull out under pressure. 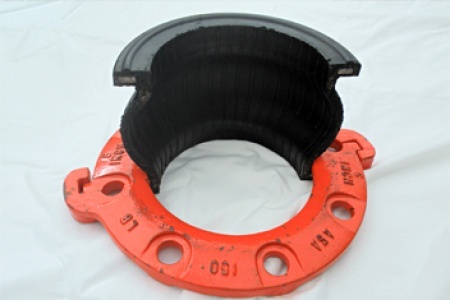 This has been known with wire reinforced collars in bellows with wire or nylon reinforced bodies. The other big plus with SAFEFLEX BELLOWS is the split backing flanges. When rubber bellows reach the end of their life the vast majority are thrown away complete with the flanges. You can replace the rubber elements but only under workshop conditions and special equipment and know how, so as not to damage the rubber element. With SAFEFLEX BELLOWS there is no such problem. The fitter on site, after isolating and draining down, can unbolt the split flanges and slip the new element into position. SAFEFLEX BELLOWS are peroxide cured and they are ‘ribbed’ through the bore to encourage minimum turbulent flow. Flanges are commonly available BS4504 PN16 (the photograph cut away body sample just happens to have an ASA150) but most flange tables can be supplied. SAFEFLEX BELLOWS are only available in the UK from Interflex of which SUPAFLEX PIPELINE EQUIPMENT is a Division specializing in all types of bellows and hoses, Microbubble Air & Dirt Separators, anti-vibration mounts, inertia bases and spring hangers. Safeflex Kevlar Reinforced Rubber bellows have been supplied on a number of projects in place of steel cord reinforced units. This has often also meant eliminating the use of units with tie bars as well. This has occurred on Cambridge University projects, a local authority building in Hertfordshire and a number of sites dotted around the UK. Please read the PR article on the Safeflex Bellows or contact us for more details.